Bunbury City Speedway didn't exactly get of to the best of starts in 2016, A massive bush fire that started from lightning strikes in the Waroona area quickly spread, Strong winds ﻿pushed the fire in a South Westerly direction toward Yarloop blocking off the inland South ﻿West Highway as well as speading to the East of Waroona, Another front was being ﻿pushed toward the Lake Clifton area which is on the coast, This fire blocked off the Forrest ﻿Highway. 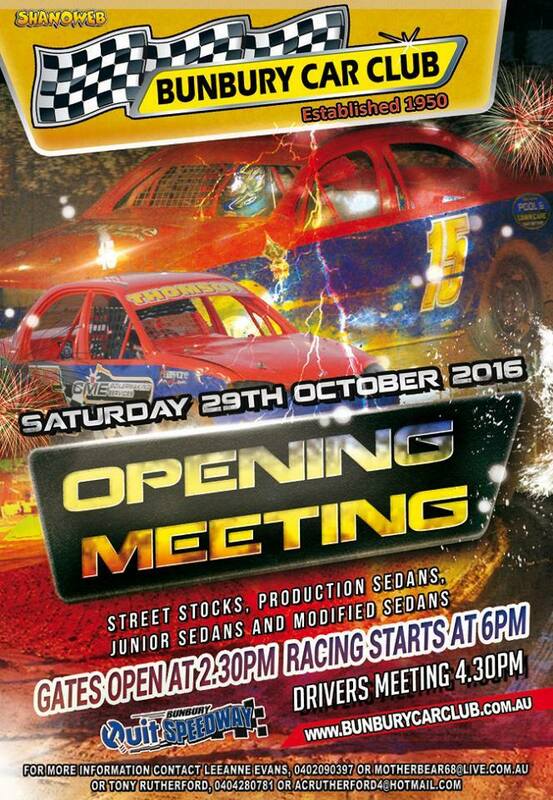 With both highways cut from the Perth Metro area to Bunbury Speedway, it was decided to call off the 9th of January 2016 meeting. There was an alterative route available via Albany Highway to Williams then across to Collie and onto Bunbury, Authorities warned the management at Bunbury Speedway that this route was already heavily conjested an the added speedway traffic would double or triple ﻿travel time of the normal two hour trip, as it was a ute and caravan rollover stopped traffic completely at on stage. The fires continued in a South Westerly direction destroying the historic town of Yarloop which just happens, was the home town of the great solo champion Sig Schlam who died at WACCA Ground when he collided with the track fence back in the 1920's. Harvey was next to be threatened but finally ﻿on the Saturday the winds had dropped ﻿and ﻿that fire was within the containment lines set up. On the second front the fire was charging toward to coast and South, evacuation orders were given for the beach side communities of Preston Beach, Mylup and Binningup, some Preston Beach residents had to be evacuated by boat. Myalup is the home of the Maolo family and LJM Racing who were in the direct line of the raging fire. Speedway Chaplin Terry Dorrington reported on social media that he had spoken with Larry Maolo and he was exhausted, He told Terry they had just lost one of there workers houses and they were currently defending there own. 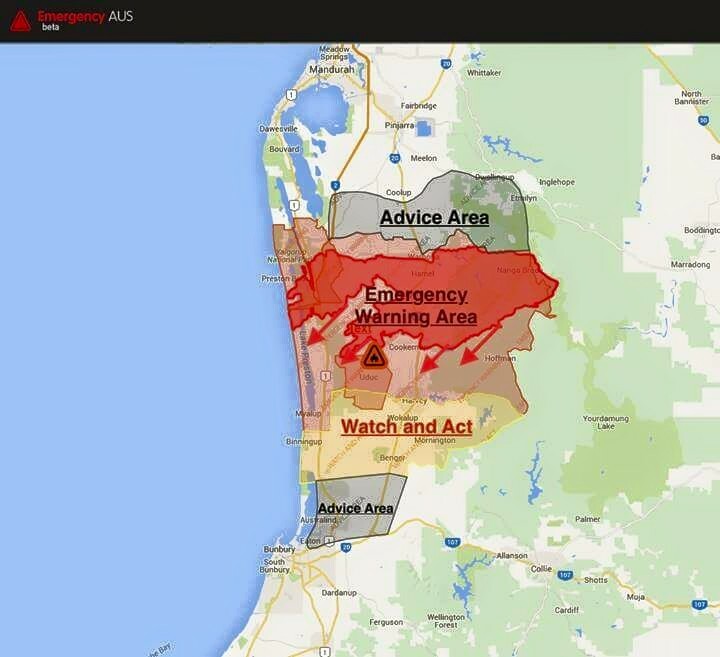 ﻿﻿﻿The authorities managed to stop the fire just before Binningup, not before the evacuation order was given on the Friday night. 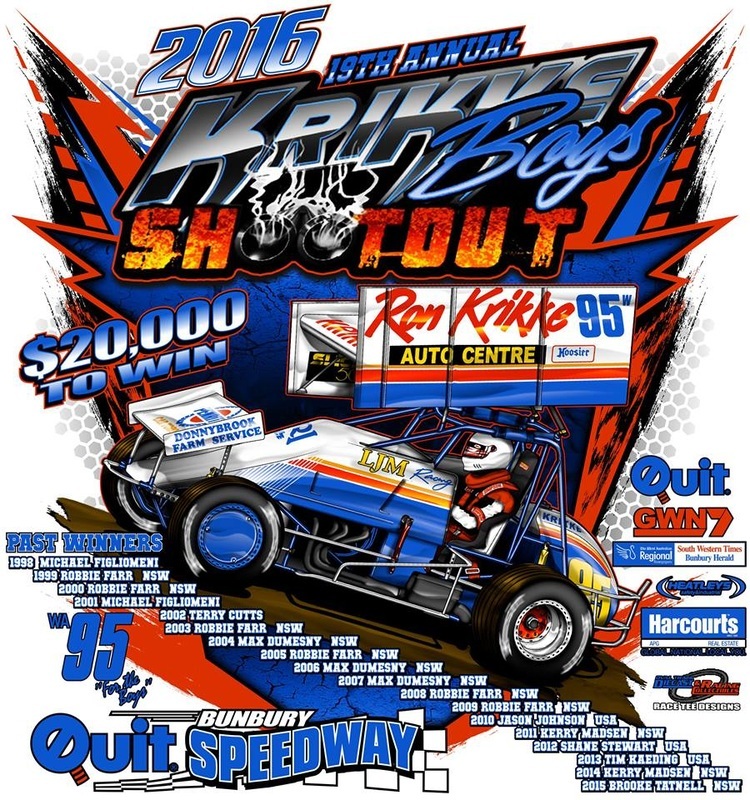 2016 - Kyle Hirst takes out the 360 Sprintcar feature as well as the World Series Sprintcar round at Bunbury Speedway. 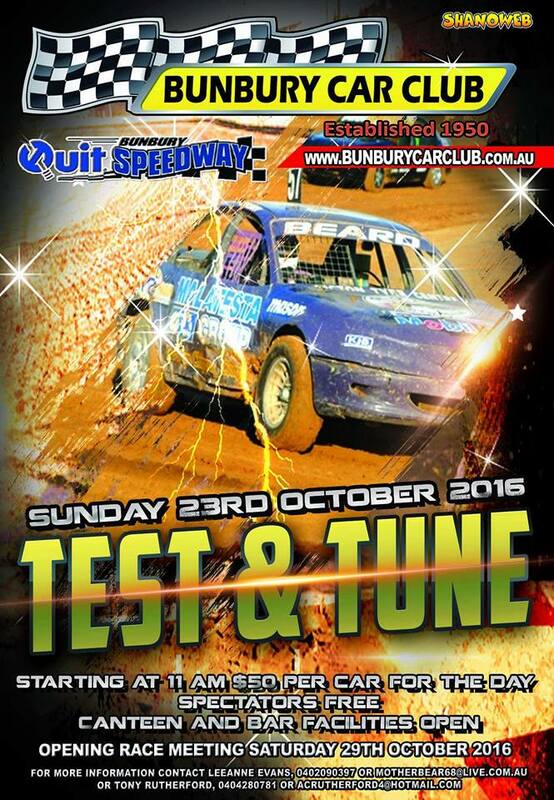 Bunbury City Speedway hosted the 2016 2017 West Australian Junior Sedan title between the 27th and the 29th of January 2017. 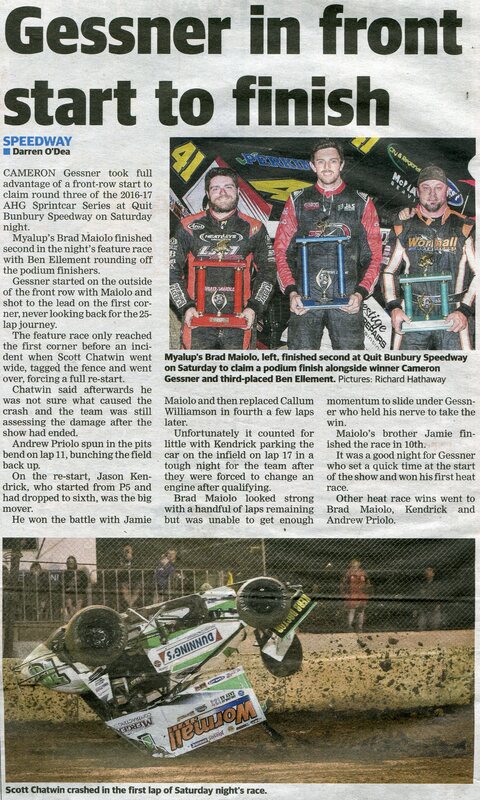 Home town champion Brad Maiolo driving for the LJM team took out Grand Slam event from Daniel Harding and Jason Kendrick. 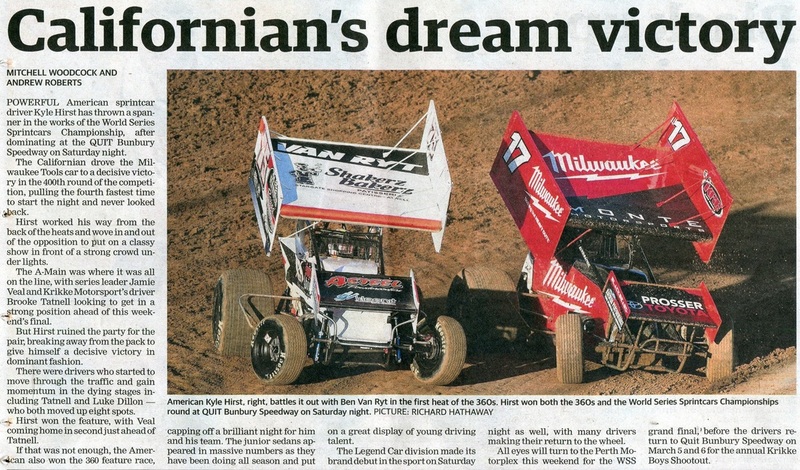 The Sprintcars were supported by Super Sedans and the V6 Wingless Sprintcars. 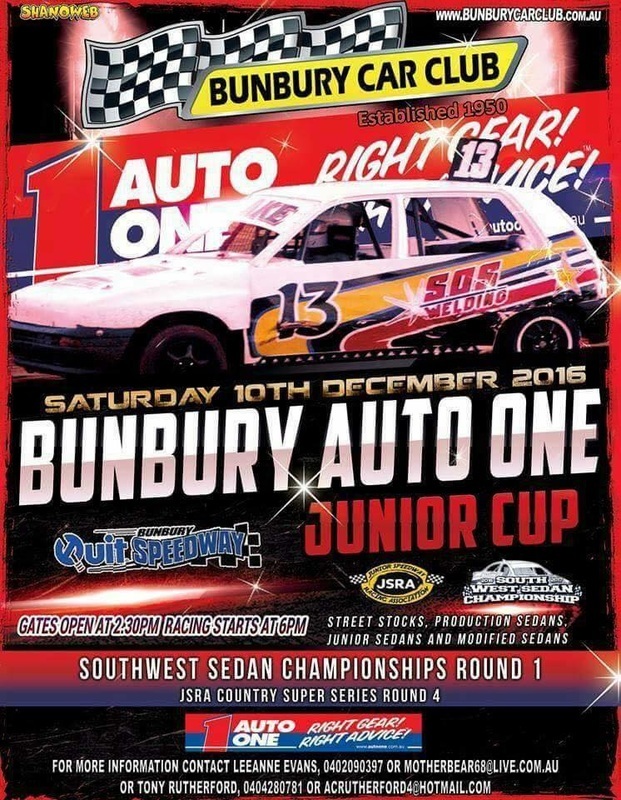 Saturday the 9th of December saw Bunbury Speedway host the Junior Sedan Cup for another year, The competition was fierce in both the New Stars and Top Stars. 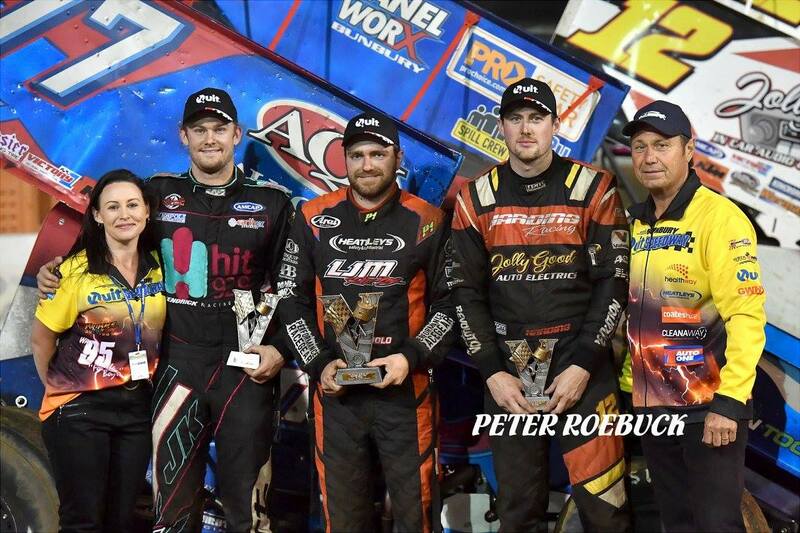 The New Stars were certinatly not outdone by the more experienced Top Stars with Aiden Doak leading home Mathew Thomson and Brandon Buzsan in there feature. 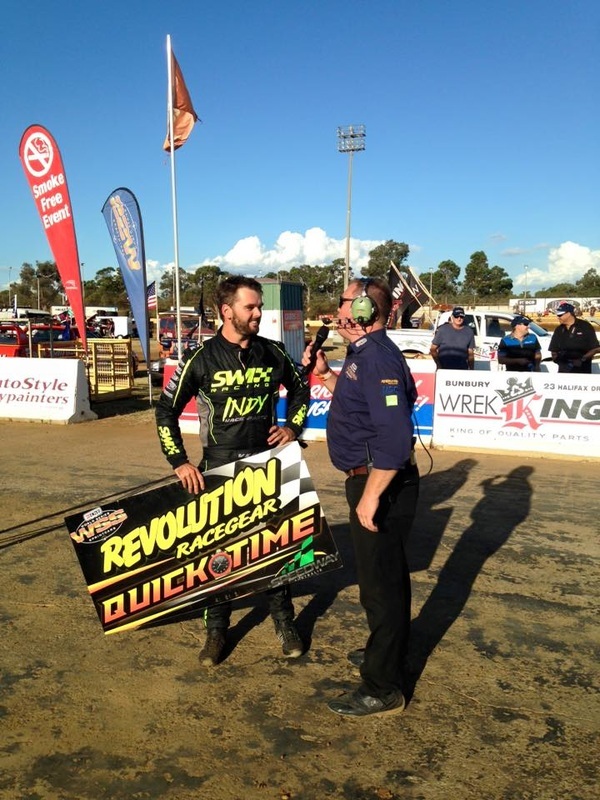 The Top Stars turned it on during the heats as well as the pole shuffle. Nathan Carter would take out that pole shuffle from Izzac Delaporte. Feature time and some fast lap times on the smooth track with Delaporte and Carter trading positions throughout the race, In the end Nathan Carter took the win from Izzac Delaporte, then Blake Webb and Beau Doyle. Thomson third, As usual Production Sedans put on a great show, Barry Rewell was impressive until he had engine problems, Brad Mitchell looked good early, he and Matt Prunster giving each other no advantage in some tight racing, Wayne Leviston held out Matt Prunster to win the feature, Glenn Hoskins who has been absent from racing for a period returned on the night to take third place. Damon Thomson from Collie is allways impressive on the big Bunbury track. Photo: Fastlane Photographics. Freddy Kinsella 2nd placed in the feature. Photo: Fastlane Photographics. Bunbury Champ Wayne Thomson had to settle for a third in the feature. Photo: Fastlane Photographics. Wayne Levingston is enjoying a purple patch at the moment and racking up the wins. Photo: Fastlane Photographics. 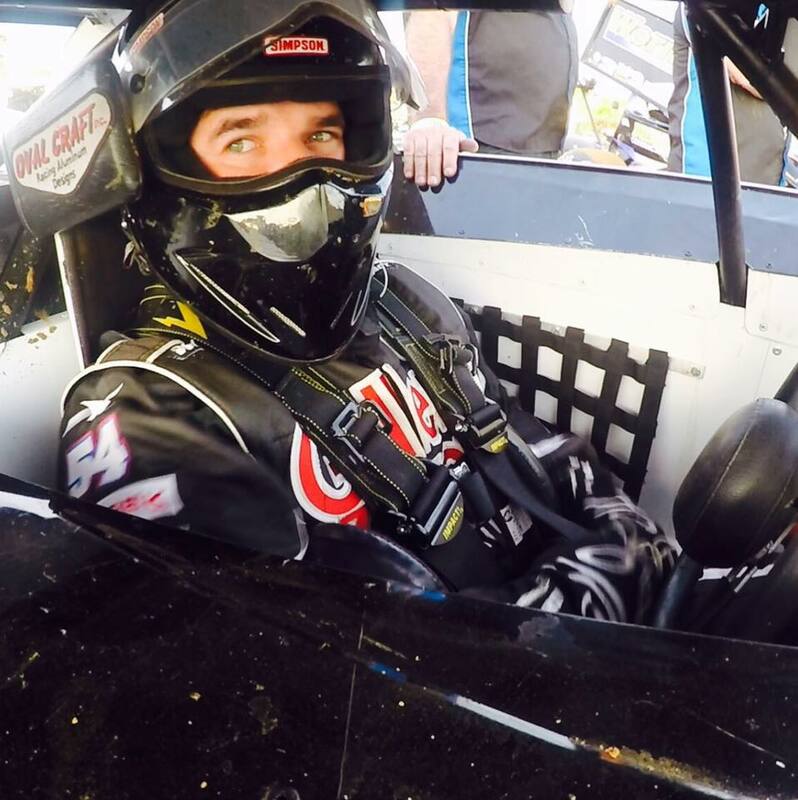 Matt Prunster enjoyed the night with a solid 2nd in the feaure. Photo: Fastlane Photographics. Former WA champ Glenn Hoskins outside returned to the raceway after a break. Photo: Fastlane Photographics. 3rd Brody Clive - 1st Jack Alfirevich - 2nd Cameron Alfirevich. Photo Debbie Alfirevich. Mike Gould the main man behind legend car racing in WA. Photo: Fastlane Photographics. 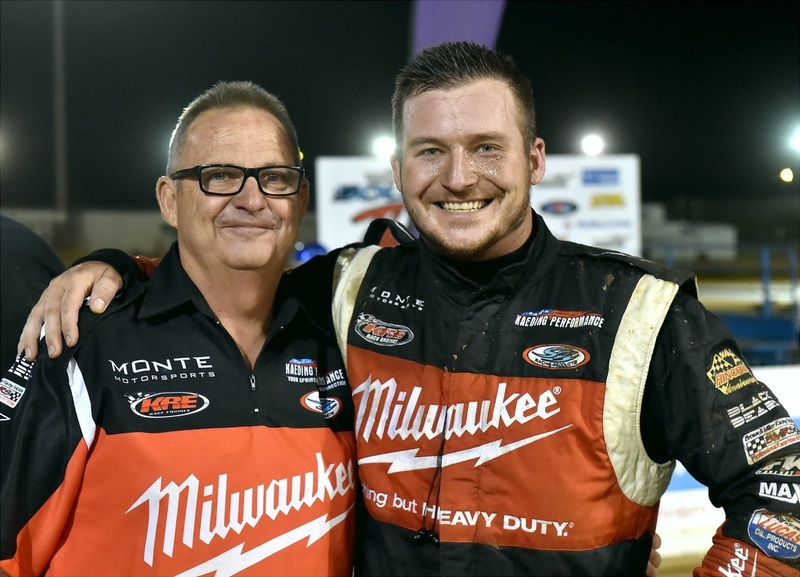 Jack the "Jet" Alfirevich is virtually unbeatable in the popular legend cars in WA. Photo: Fastlane Photographics. Cameron Alfirevich allways put on a show taking it up to his brother Jack. Photo: Fastlane Photographics. 3rd placed in the feature Brody Clive on the outside of Mike Gould. Photo: Fastlane Photographics. Twenty Two years ago the titles were held at Bunbury Speedway for Sprintcars and the above photo was taken of Breeana with Gary Rush when she was two weeks old nearly to the hour, well twenty years on but not quite to the hour the chance came along to have another photo taken, Thank you to Ron Krikke and Wade Aunger for doing the interview otherwise I wouldn't have known, thank you Garry for taking the time to have the photo taken as well. 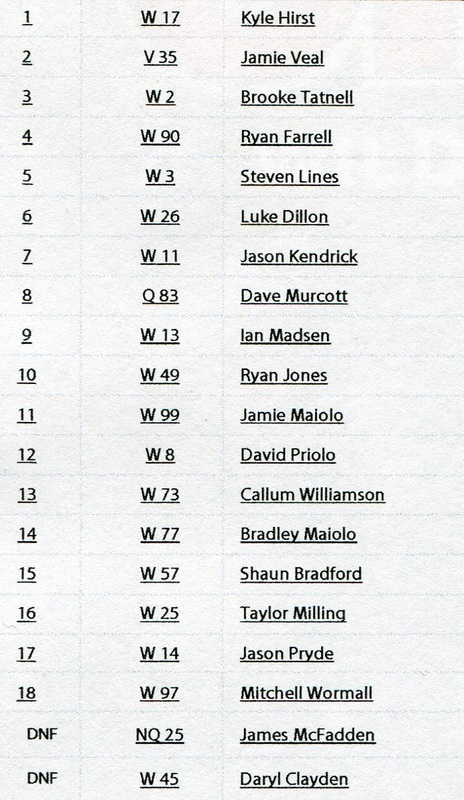 After 14 rounds Jamie Veale finished second in the WSS Championship Point Standings. Photo: Richard Hathaway. 2018 - Local racer Adam Houston easily won heat one of the Modified Sedans. Photo's: Fastlane Photography. 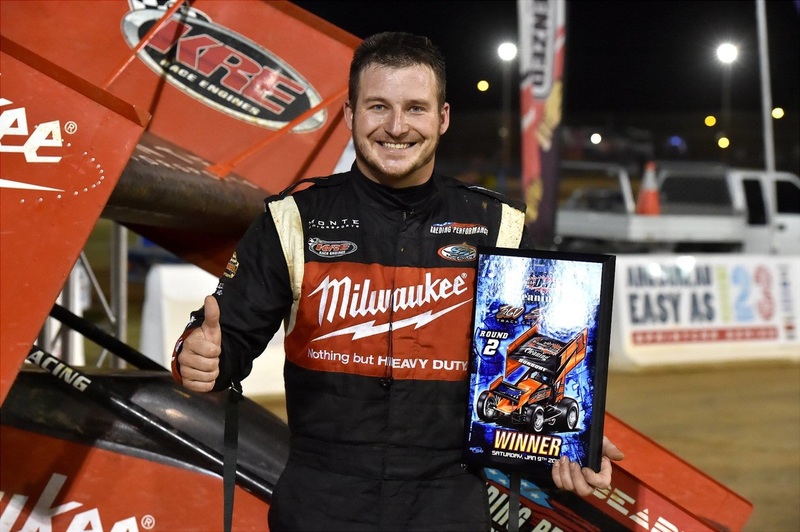 2018 - Peter Forbes won the Modified Dirt Rod heat before the rain ended the meeting. Photo: Fastlane Photography. 2018 - Bunbury's opening meeting ending after a full first round because of rain. Photo's Jason Crow. The City of Bunbury has a very rich history in speedway dating back to reports of a speedway track at Lake Preston in 1923, By 1927 the farther of promoted speedway Johnny Hoskins was working with the Bunbury Council to rip up the sealed running track around the Recreation Ground and lay down a dirt motorcycle speedway track to run under lights. 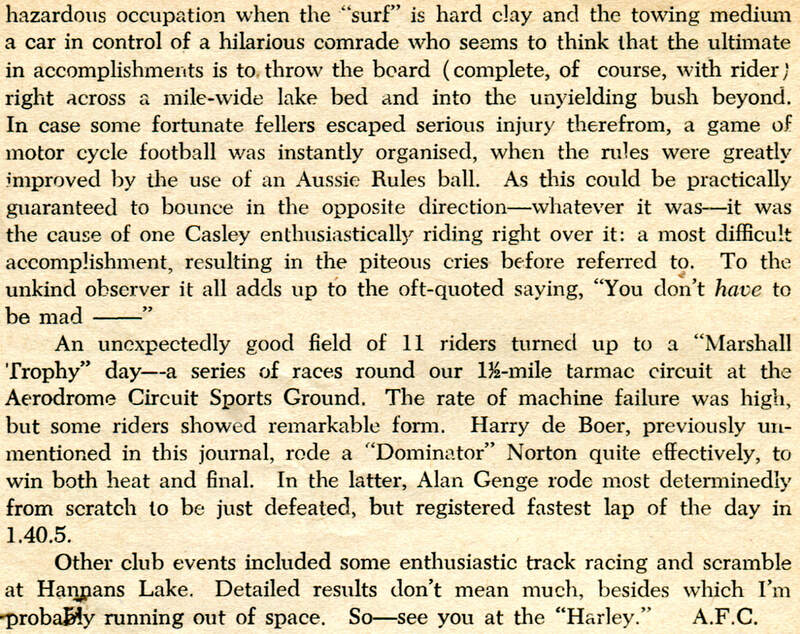 Also in 1927 a young Bunbury dare-devil by the name of Stan Catlett was making a name for himself at Claremont Speedway, Catlett offered to work on the crew of a steamer headed for England to pay for his passage, There he was a part of the Hoskings team that took motorcycle speedway racing to the rest of the world. At the height of his career in 1933 Catlett returned to Bunbury to start up a car dealership "Winterbottoms" it was on that visit that Catlett while flying his borrowed plane back to Perth crashed in bush, just behind were the CSBP Super Works is now, killing himself and his passenger Mr Colin Teede. 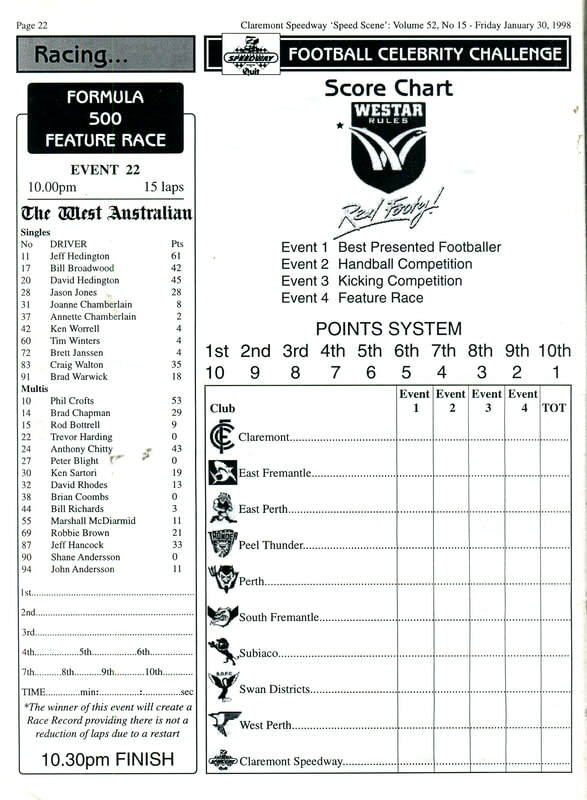 In 1930 the Bunbury Showgrounds, now Hands Oval, hosted motorcycle speedway racing, At one of these events a rider by the name of Charles Wear crashed into the fence and later died in the Bunbury Regional Hospital. By 1954 at the showrooms of Walton and Gardiners Holden dealership in Spencer Street, now the Admiral Inn, The Bunbury Car Club was formed, initially holding car trials and speed event, notable names of the day were, Pop Hudson, Jim Renfree, and Ernie Stevens. During the 1960's the clubs attension shifted to mud scrambling events at Paddy's Blunders, on the edge of the estury, next to Koombanna Holiday Park. Blunders was almost always under water and the cars were fitted with chains around the wheels for traction, The sloshy competition was governed by the tides, but the club still managed to get in about 8 race meetings a year, Drivers of note through this period were Colin "Roo Dog" Resta, John Hudson, Eddie Logan, Vern "Whimpy" Karlson and Jim Wilson. Mineral Sands mining took over the area in the 1960's and the club built a proper hard base speedway on the edge of the Collie River near the Eaton bridge. A man by the name of Reg Blicks who owned the Blicks caravan park lent the club a portion of his land to build the track on, This arrangement lasted until 1970 when Reg closed the park and sold off the land. The club raced on sundays at Blicks, Speedway was becoming very popular with new drivers coming from all over the south west with there Holdens, Fords and pommy cars, Ladies racing was introduced with drivers like Judy Doig, Nanette Melvin and Wendy Lainge, Many of the men from this period would go on to race under the bright lights of Claremont, Bunbury and Perth. This was the years of Hot Rod racing, most of these cars were early model cars fitted up with v8 engines, Richard Hartzer ran a 1934 Ford coupe powered by a Customline v8 engine, Colin Resta a v8 powered Vangaurd, Richard Corbett and Lindsay Robinson in the Lil Ol Austin powered by a supercharged Holden red motor, these drivers in there machines were a match for any of the others around the state, Supermodified drivers such as Graeme Wheat, George Lane, Brian Brockman, Don Collins, Eddie Lainge and John Hudson all took on the visitors in Martin Laughton, Alan Nylander, Geoff Brown and George Lee. The stock cars were very cheap and popular, local drivers such as Robert Harding, Bill Barr, Darrel Thomson, Mick Bayliss, Vern Baker, Mick Triplett, Brian Hillman and not to forget Brian McRae in that bloody Honda Scamp. When Blicks closed the club was left without a home until this new venue opened in November of 1972. a few site were looked into, such as Hay Park, a piece of land along the Waterloo straight, or this useless swamp land on the North Boyanup Road. Qoated by the press as the biggest crowd ever to see a sporting event in the South West, Bunbury Speedway under the management of Tom Dillon opened with a star studded line up, Les Sharpe just back from England won all 3 A grade solo races ahead of Chum Taylor and Bob O'Leary, Local B grade solo star Don Collins won 2 of his races and ran 3rd in another, The rest of the program consisted of sidecars, Speedcars in which Bob Godard and Geoff Pilgrim stared in, In the Juniors, Phil Baker and Jenny Turnor stood out, While in the Production cars, Dave Haldane won the feature in his Mini while Stan Starcevich would end his night in the fence. Since its opening Bunbury Speedway and the Bunbury Car Club have endured a colorful past, through it life time the track has hosted some of the biggest names in the world, Ivan Mauger, world champion solo rider was the first of these solos riders to be brought here by Tom Dillon, he also got many more to appear such as Bert Harkins, Malcom Simmons and the British Lions test team, over the years Bunbury has hosted some of the best solo racing in Australia, from those early day when our own Perth, Bunbury and Collie riders took on the best in the world, Chum Taylor, Bob and Terry O'Leary, Les Leisk, Les Sharpe, Rod Chessel, Peter Thompson, Lloyd Cross, Don Collins, Wayne Patterson just to mention a few, Through to the later period when the promoter's of the Des Ferris and Brian Mullings brought to Bunbury Speedway the Series 500 Solo Series, this featured some of the best solo riders from every country in the world. Bunbury Speedway started off as well known for its Sedan Car racing, from the get go, the big names were thrilling the crowds, First was Gene Welsh from the USA who also brought out 4 cars teams at a later date, those teams featured, Wayne Sue, Hash Brown, Rodney Coombs and Big Ed Wilbur, Bunbury had a solid base of drivers as well, Richard Hartzer, John Hudson, Johnny Clapp, Allan Blake, Mick Bayliss and Colin Harper, In later years, Brad Blake, Ivan Burke, Darrel Thomson, Greg Freeman and many more, many of the Claremont based drivers would often turn up to race at Bunbury, such as Stan Starcevich, Laurie Hardy, Barry Blake, Alan and Craig Nylander, Vic Trimble, Bert and Craig Vosbergen, Peter Harvey, Ben, Stan and Brad Ludlow, Tony and Marc Giancola and the list goes on. All this changed during a period when John Fenton was promoting the track, John was hooked on Sprintcar racing and was the man responsible for getting a very young Ron Krikke a ride in a sprint car, This ride was in fact to be John's and Ron's at some lesser meeting, after John saw how natural Ron was in the car, he stepped back and suggested to car owner Peter Krikke that just Ron should race the car, And that was the case Ron would go on to win 2 national championship and multi pull State title's as well as blue ribbon events, Ron's son Darrel also had that will to win in his make up when he started racing, firstly in a aged car, he caught the eye of Larry Maolo who set Darrel up in a brand new car and team, Traggerty struck however when Darrel and his crew chief, Jason lost there lives in a car accident while returning home from Clarmont Speedway one Friday night. Sprintcar racing had taken the world by storm and the fans were packing out Bunbury Speedway on a regular basis, Sprintcar racing is very expensive and demand big prize money, some of the local company that got behind this movement were Bunbury Toyota, Discount Auto Parts, City and Regional Fuels, Framfield Holdings and Bunbury Plumbing Services, just to mention a few. As the years have passed and the sport of speedway has become more professional, many racing divisions have set up there own controlling bodies, to set out there yearly race calander and lock in race dates with the tracks, This leaves the Bunbury Car Club to look after and maintain this world class facility, hold race meeting, weather they be big promoted world standard shows or just club shows, Over the years the Bunbury Car Club has been blessed to have such great promoters at the helm, like Tom Dillon, Allan Blake, John Fenton, Des Ferris, Bryan Mullings, John Gandosi, Ron and John Krikke, all of these people and there teams, all brought something to the table at various times in the tracks life, to ensure the sports long life in Bunbury. That illfated flight that took the life of Stan Catlett. Colin "Roo Dog" Resta at Paddy's Blunders. Richard Hartzer leads Graeme Wheat at Blicks Raceway. Don Collins in his Supermodified at Blicks Raceway. 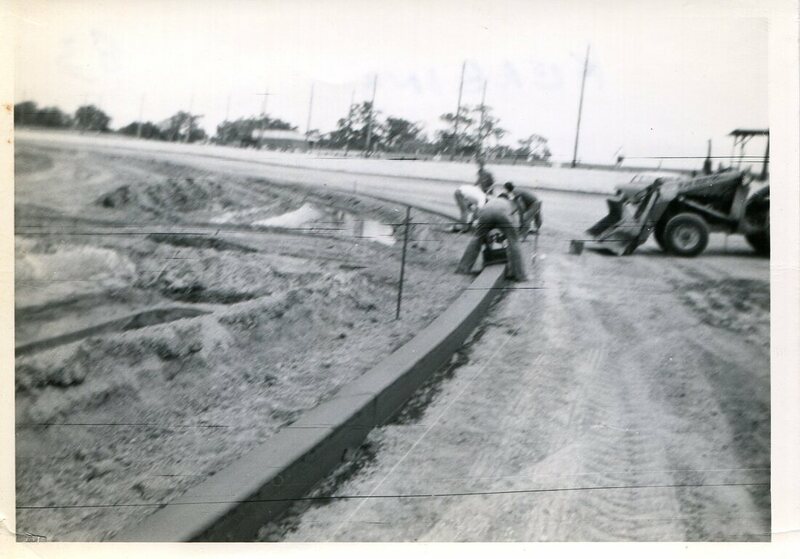 Bunbury Car Club members building Bunbury Speedway. Bunbury Mayor Dr Manear with Richard Hartzer. 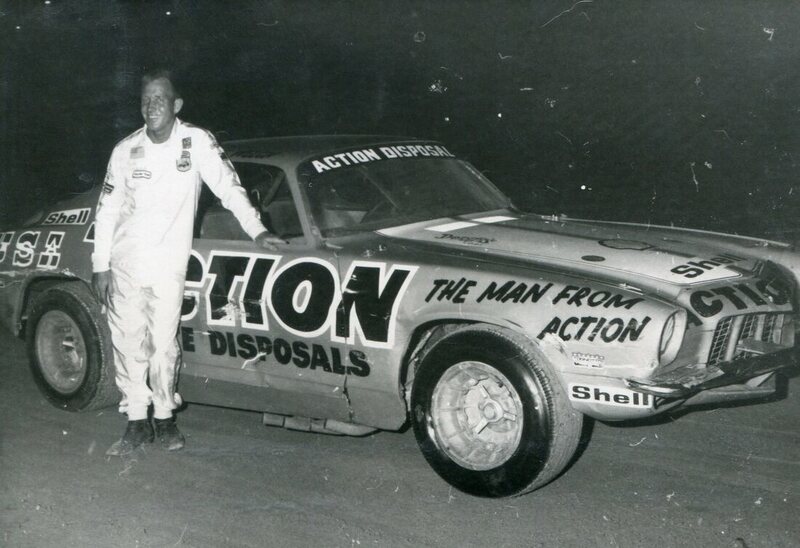 American racer Gene Welsh racing at Bunbury Speedway. Ron and Darrel the master and the apprentice. Bruce Killpatrick from City & Regional and Eddy Gobby. 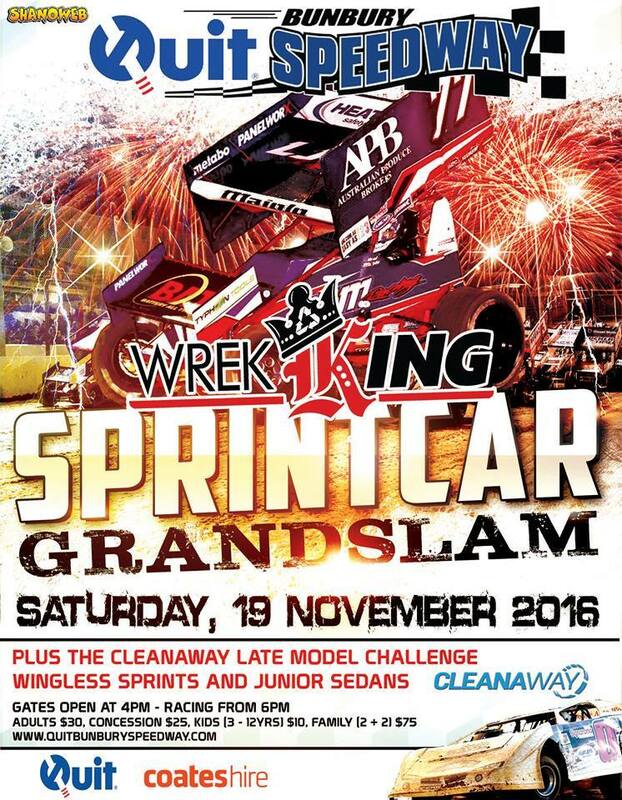 This was to be the Mother of all Sedan Car meetings, The whole event was the creation of the board of Speedway West Australia and the Bunbury Car Club, The event was always going to be big with around 140 nominations received over 5 divisions. drivers, but they all seemed to handle the situation well, some opting to run the gutter, others the traditional half track high line and a few brave ones right on the wall chasing drive in the heavy dirt, this made for some of the best racing ever seen at Bunbury City Speedway. With the heats and consolation races out of the ways the showers became a little heavier and it looked like we may be all back here again tomorrow, But it was not to be, With the guidence from Jerome over the one way communicators and fields of the best drivers in the state, All the features were run with no problems at all. All in all i would say that the meeting was a complete success, As a sideline to the event the program featured a display of Classic Speedway cars rolling around the raceway and leading away the features, As well the organisers set up a VIP area and many past champions and officials were invited to attend, This was well supported with many people shaking hands for the first time in over 30 years. 2018 - Blake Ivanow dominated. Photos: Peter Roebuck. 2018 Kyle pure silk in the feature. Photos: Peter Roebuck. 2018 - Matt Noakes number 20 saved the best for last. Photo's Peter Roebuck. Home town racer Adyme Harvey. Photo: Peter Roebuck. 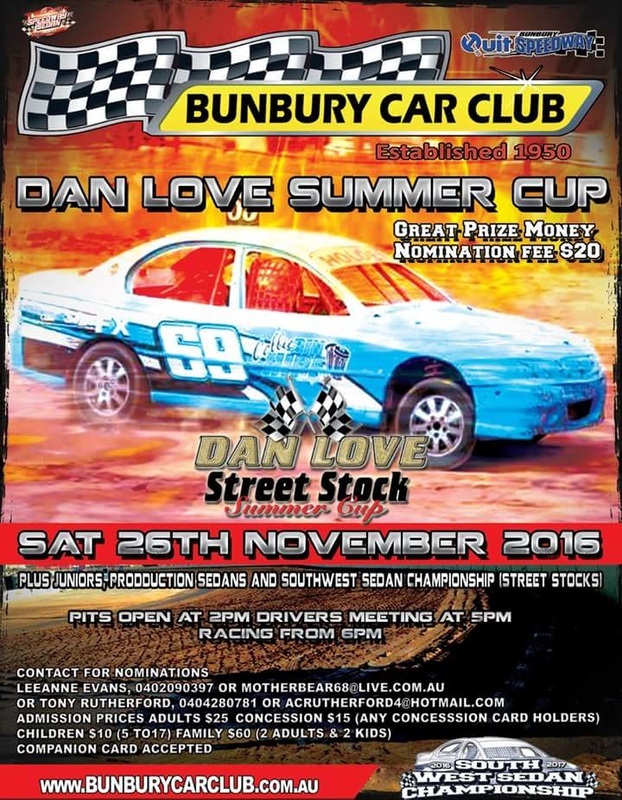 All the attension was focused on the Street Sedans this meeting as it was the last ever Dan Love Summer Cup for Street Sedans, This race has been the highest ranked Street Sedan event on the Bunbury Speedway calander for the last 25 years. Let me tell you about Dan Love, Dan the bussiness man was a very successfull bus company operator, He lived in Bunbury and ran his Australia wide bus network, as well as other interest from Bunbury. He was a major sponsor to racer Kim Williams who just so happened to work for Dan. Dan the racer was a fierce competitor and insisted on the best cars and equipment that was available and was prepared to pay for it, Dan was quite generous, As he learnt the ropes and upgraded his gear Kim was still being looked after in exchange for his car craft of maintaining the cars, it was not beyond Dan to loan an excess race car to an employee or friend to have a skid, Joe Perry one of Bunbury's leading sign-writers would always be on hand to paint the guest drivers name on the car. 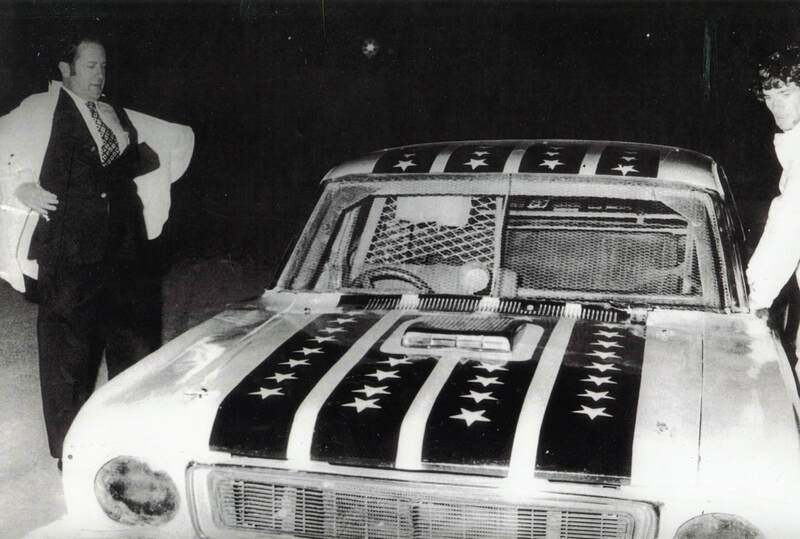 Dans choice of racecars were Greg Freeman built cars, right through his Street Sedan and Modified Sedan days he would insist on the Freeman Product with Kim maintaining it, and yes he was rewarded. A photo that will be etched in history for ever, 3rd generation racer Warren Oldfield holding Jack a potential 4th generation racer after Warren's win in the final Dan Love Summer Cup. Photo: Oldfield Racing. 2018 - Warren Oldfield in #85 leads Geneve and Norman. Photo: Fastlane. 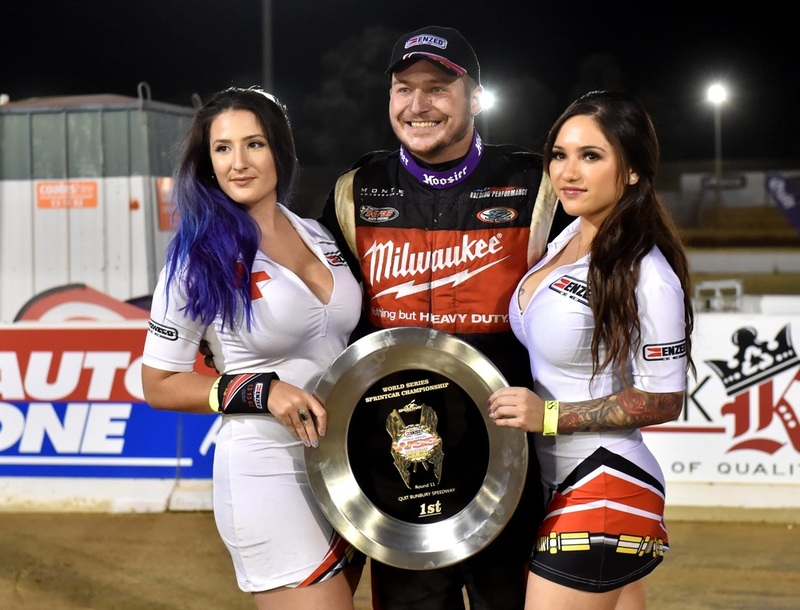 The fourth and final round of the Late Model Sedan Nationals was hosted by Bunbury Speedway on the 19th of January 2019, Round's one and two were both held at the Perth Motorplex, with the third round going to Collie Speedway.